GERMANY: All 77 foundations are now in place at the Borkum Riffgrund offshore wind project in the German North Sea after GeoSea completed the installation work. The work on the up-to-684-tonne monopile foundations included transport from the fabrication yard to the marshalling harbour, the piling work itself and the fitting of the 330-tonne transition pieces. Dong Energy - the project developer - supplied its Pacific Orca vessel to be used by GeoSea during the installation work. 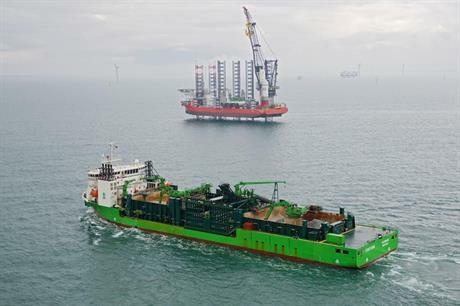 Dutch offshore contractor Tideway has now taken over from GeoSea to carry out scour-protection work on the foundations before the start of turbine installation later this year. The 277MW project will be made up of 77 Siemens SWT-3.6-120 turbines. The machines are expected to be in place in 2015, with grid connection due later that year.